SAN DIEGO, California -- The two most important recreational fisheries off Southern California have collapsed, according to a new study led by a researcher from Scripps Institution of Oceanography at UC San Diego. Scripps postdoctoral researcher Brad Erisman and his colleagues examined the health of regional populations of barred sand bass and kelp bass-staple catches of Southern California's recreational fishing fleet-by combining information from fishing records and other data on regional fish populations. Stocks of both species have collapsed due to a combination of overfishing of their breeding areas and changes in oceanographic conditions, the researchers found. As they describe in the most recent edition of the Canadian Journal of Fisheries and Aquatic Sciences, the researchers say the total amount, or biomass, of each bass species decreased 90 percent since 1980. Yet fisheries catch rates have remained stable for a number of years, even as overall population sizes dropped drastically. This is due, the authors say, to a phenomenon known as "hyperstability" in which fishing targets spawning areas at which large numbers of fish congregate, leading to a misleading high catch rate and masking a decline in the overall population. "The problem is when fish are aggregating in these huge masses, fishermen can still catch a lot each trip, so everything looks fine-but in reality the true population is declining," said Erisman, a member of the Scripps Center for Marine Biodiversity and Conservation. "So as the true abundance is declining, the fisheries data used to assess the health of the fisheries are not showing that and give no indication of a collapse-this is referred to as 'the illusion of plenty.'" Erisman says the cod fishery that collapsed in the North Atlantic Ocean is the world's most famous example of fisheries data masking an impending collapse, but other fish stocks in regions where fish congregate to spawn are declining as well. The authors acknowledge that both bass species began declining in the early 1980s, a drop other studies have directly linked with a climatic shift in regional water temperatures. But they say fishing impacts exacerbated the declines. "The combined evidence from this study indicates that persistent overfishing of seasonal spawning aggregations by recreational fisheries brought about the collapse of barred sand bass and kelp bass stocks in Southern California," the authors write in their paper. "The relationship between catch rate and stock abundance suggests there is an urgent need to incorporate fisheries-independent monitoring to create something sustainable and monitor the fisheries effectively," said Erisman. "While fisheries monitoring remains a key part of management, it is clear that such data alone do not provide an accurate assessment of stock condition." Overgrazing of the commons(i.e. the Sea) will lead to the tipping point and ultimate collapse of Life in the sea unless and until proper, dictatorial management of Ocean fisheries halts such degradation or reinvigorates such Life. A World in Crisis needs a "World Solution" to a "World Problem." At least some of us are aware of the problem. Wish someone would speak to the over-arching problem facing us all on Spaceship Earth: THE LIMITS TO GROWTH. If not, Apocalypse?! It isn't just fishermen or biologists worrying about the state of our oceans any more. We discuss the 90% decline in oceanic fish in our school programs. The problem remains insidious because it is hidden beneath the water, so we must speak out. And shame on the Times for the last sentence: "Views expressed in this article do not necessarily reflect those of UnderwaterTimes.com, its staff or its advertisers." This is not an editorial. I grew up fishing SoCal saltwater. Back in the old days, it was pretty much "kill everything". That has changed. The sportfishing captains, crew and passengers have been forced for years to do more and more catch and release, due to declining stocks. So why doesn't California's Fish and Game just shut down saltwater bass fishing until the stocks recover? In the Puget Sound, for example, there is a 1-fish limit for any sebastes rock fish. 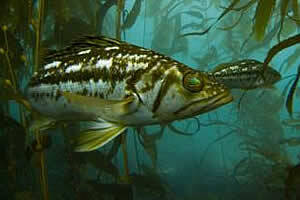 Calicos and sand bass are slow-growing fish and non-pelagic, like rockfish. And as people become more educated about the life cycles of these species, they will be more ameniable to closing down the taking of them. Calicos and sand bass fishing is great fun, but they're not the best eating. (I recommend some fresh caught northwest sockeye instead.) So remember that that 12" calico you catch might be 4 years old and mating already--that's no baby fish. If a species is wiped out , like sharks for their fins , (which made into soup is tasteless until seasoned )then that fish stops controlling it's normal prey and that prey populates and over eats on another species causing a chain reaction in nature to radically lose the normal habits of fish and the circle of life in the ocean is broken. See what happens when man is involved. I'm a sport fisherman that wants my great great grandchildren to catch fish and they are not born yet.